When I design jewelry, two of my greatest delights are 1) to combine something from the Earth with something from the Sea or 2) to gather the component elements from a variety of countries or continents, pulling the whole world together. I don’t always get to do both as I did in this piece. 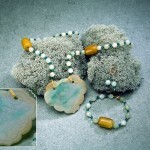 The large Jade pillow beads in this set come from Asia and are Nephrite Jade. The pearls are naturally grown and naturally colored, by minerals in the water where they grew. 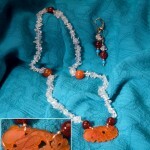 The smaller pillow beads are Peruvian Opal. 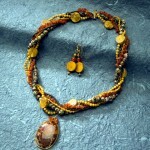 The large round bead is made from a quartz crystal called Lodolite mined in Brazil. 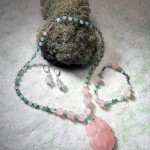 The soft pastel of the Jade seemed to require pairing with the undyed natural pearls in two sizes. 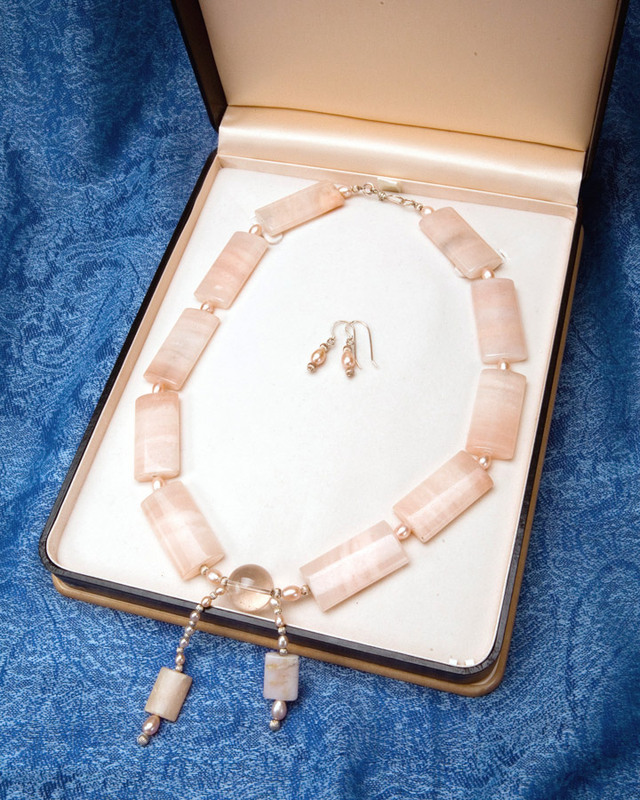 I could not find Peach Jade in a smaller pillow bead to finish the design, so as happens from time to time, I decided to wait till I could find an acceptable substitute to finish the jewelry. This was difficult to do, because it is impossible to match colors from even the best of digital images. Finding a strand of Peruvian Opal beads at my only local dealer some time later was unbelievably fortuitous and only a few stones on that strand matched well enough to use. What a blessing! Had a hard time finding smaller compatible rectangles to go with the Jade and Pearls but I’m glad I waited for the Peruvian Opal – glad you enjoy this piece. Thank you for the review!